System Center Service Manager 2010 offers enterprises a complete, integrated platform for adopting and automating service management best practices, such as those found in ITIL and Microsoft Operations Framework (MOF). Now, there's a comprehensive, independent reference and technical guide to this powerful product. A team of expert authors offers step-by-step coverage of related topics in every feature area, organized to help IT professionals quickly plan, design, implement, and use Service Manager 2010. After introducing the product and its relationship with the rest of Microsoft's System Center suite, the authors present authoritative coverage of Service Manager's capabilities for incident and problem resolution, change control, configuration management, and compliance. Readers will also find expert guidance for integrating Service Manager with related Microsoft technologies. This book is an indispensable resource for every IT professional planning, installing, deploying, and/or administering Service Manager, including ITIL, MOF, and other IT consultants; system administrators; and developers creating customized solutions. Kerrie Meyler, MVP, is the lead author of numerous System Center books in the Unleashed series, including System Center Operations Manager 2007 Unleashed (2008), System Center Configuration Manager 2007 Unleashed (2009), System Center Operations Manager 2007 R2 Unleashed (2010), and System Center Opalis Integration Server 6.3 Unleashed (2011). She is an independent consultant and trainer with more than 15 years of Information Technology experience. Kerrie was responsible for evangelizing SMS while a Sr. Technology Specialist at Microsoft, and has presented on System Center technologies at TechEd and MMS. Anders Bengtsson is a Microsoft senior premier field engineer, focusing on System Center. He was involved in the Service Manager TAP with one of the largest Service Manager TAP customers. Anders has written a number of System Center training courses, including the Service Manager and Operations Manager advanced courses for Microsoft Learning. Before joining Microsoft, Anders was a Microsoft MVP from 2007-2010 for his work in the System Center community, including more than 10,000 posts in news groups and forums. Anders has presented and worked at numerous Microsoft conferences and events, including Microsoft Techdays and Microsoft TechEd EMEA. Patrik Sundqvist is a senior consultant working as a solution architect, focusing on developing automated solutions for IT processes on the System Center platform. Since the early beta of Service Manager, Patrik has worked with the Service Manager product team to develop community solutions for Service Manager. Over the past eight years, Patrik has developed custom System Center solutions for some of Europe's largest companies. 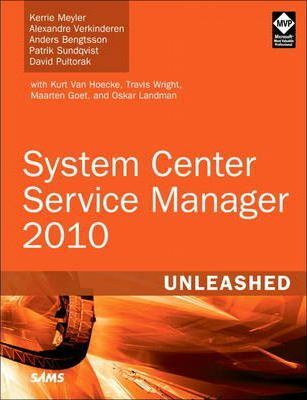 Patrik was also one of the authors of the level 400 Service Manager course for Microsoft Learning. He often speaks at Microsoft events and is a member of the Microsoft Extended Expert Team. David Pultorak, ITIL Expert (V3), ITIL Manager (V2), MCSE, MCP, MCT, and CTT, is founder and principal consultant of Acceleres, specializing in Microsoft (R) System Center Service Manager and Orchestrator implementation and training, and Pultorak & Associates, specializing in IT Service Management implementation and training. David is a recognized leader in the field of IT Service Management with more than 24 years of IT experience. He has contributed to ITIL (R) (V2), MOF, and COBIT. His most recent books are Microsoft Operations Framework 4.0 (Van Haren 2008), System Center Service Manager Unleashed (SAMS 2011), and the ITIL (R) V3 Foundation Exam Study Guide (Van Haren 2012). His articles have appeared in periodicals from Data Center Magazine to Directors Monthly, and his work has been featured on nearly every leading industry portal including BetterManagement, Data Center Management, Support World, and ITSMwatch. Mr. Pultorak is a regular and passionate speaker at national and international IT events including AFCOM, AITP, CMG, HP Software Forum, HP World, HDI, itSMF, PMI, SHARE, and SIM.